The Red Army continues to grow! Many people in Central Oregon are Vermicomposting! Some are new to the experience and some have tons of knowledge to share. I really enjoy meeting new people and hearing what they want to achieve. There are really helpful websites for vermicomposters around the world! If you want to see who is composting globally and add yourself to a list of red wiggler fans visit vermicomposters.com. Also there’s google’s knol which has a great article on Vermicomposting. Local shops in town like, Big Island Kona Mix Plate, thump coffee, and Riley’s Market provide tasty scraps for pick up. These scraps are put to good use and let the Super Composting Red Wigglers get a taste variety. I support Big Island Kona Mix Plate, a local family owned restaurant, in their efforts to make their restaurant “greener”. Also, Big Island Kona Mix Plate no longer uses styrofoam plate-ware, which further reduces their contribution to the landfill. Thump coffee, is a really cool coffee shop downtown (family owed as well), has an ample supply of used coffee grounds that can be used in your garden or compost pile. When my Super Composting Red Wigglers need a little pick-me-up I stop by the shop just before closing and pick up the goods. Riley’s Market, another family owned business, located in NorthWest Crossing, offers among other things, fresh organic locally grown produce, a variety of delicious sandwiches and tasty baked goods. When time takes its toll on the produce and bakery items at Riley’s Market, I am called in to take the goods to my trusty sidekicks! My Super Composting Red Wigglers are more than happy to do their part! What a great treat! 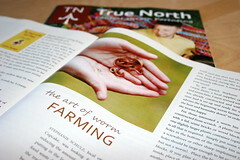 Make sure to check out the June/July edition of Central Oregon’s premiere parenting publication ‘True North’ for a very informative article on Red Wigglers. They mention the benefits of composting food waste and creating your own organic compost. Great job! Visit them online to read the full article, or pick up a FREE copy at a local retailer. Wonder Worman is growing! Super Composting Red Wigglers will soon be in the bins of LaPine Middle School and Tumalo Elementary School. Both of these schools are located in Central Oregon. These red wigglers will help with the reduction of the school waste. The compost made from the red wigglers will be used for their community gardens.